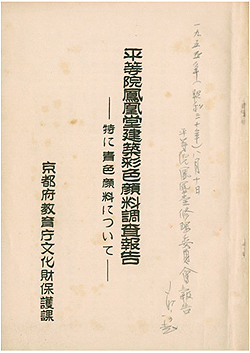 EMURA Tomoko is studying Kogabiko (Notes on Old Paintings) during the Showa Period: Using the Papers of TANAKA Ichimatsu in Future Research, SARAI Mai is studying the Papers of KUNO Takeshi, MIKAMI Yutaka (Wako University, visiting researcher in the Department) is studying Documents on Modern Art: Assembling Art Gallery Circulars and Catalogs and Topics for the Future, NAKANO Teruo (visiting researcher) is studying the Papers of YANAGISAWA Taka, WATADA Minoru is studying the Papers of TANAKA Sukeich, and TANAKA Atsushi is studying the Papers of TANAKA Toshio. 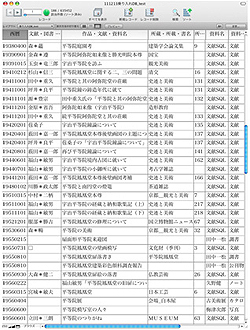 There are various databases for each category of material, preventing a full archiving of these cultural properties. To resolve this problem, basic data from the papers of TANAKA Ichimatsu, KUNO Takeshi, and UMEZU Jiro were integrated into a database of books, exhibition catalogs, art journals, original photos, and other items currently in use at the Institute. A simulation was performed with the resulting database (about 635,000 records in total). The database allows simultaneous searches of research materials in various formats and it highlights multiple trends in research. The database will provide new directions for specialized archives. Numerous issues must be dealt with so that the database can serve as a more accurate information-gathering tool, but hopes are to create an archive of cultural properties that can be utilized in various fields of study. As reported last October, the Department of Art Research, Archives, and Information Systems is conducting joint research with Eisei Bunko on Yokoyama Taikan’s Yamaji (the Mountain Path) as part of a research project entitled Documentary Research on Cultural Properties. Taikan’s Yamaji in Eisei Bunko’s collection was exhibited at the 5th Bunten Art Exhibition (sponsored by the Ministry of Education) in 1911 and is an important work that inaugurated new forms of expression in Japanese painting with its vivid strokes. 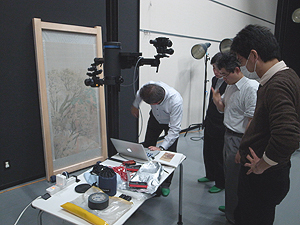 After the piece was studied last fall, it was restored by one of the Kyushu National Museum’s conservation facilities. The mounting was dismantled, the cover was removed, and the back side of the painted silk cloth was visible, occasioning a second survey on December 9th with the aid and cooperation of the Museum and the Association for Conservation of National Treasures, which supervised the restoration. Looking at the picture through the thin silk cloth from the back revealed a process of manufacture that was not apparent from the front. The piece’s characteristic brownish tint to represent leaves in fall appears to have been dotted on later on, but the survey of the back of the piece revealed that the color was applied in an earlier stage of the piece’s production. The current survey team included MIYAKE Hidekazu of Eisei Bunko; HAYASHIDA Ryuta of the Kumamoto Prefectural Museum of Art, which curates Yamaji; ARAI Kei and TAIRA Yuichirou of the Tokyo University of the Arts, both of whom were on the previous survey team; and SHIRONO Seiji and SHIOYA Jun of the Institute. Mr. SHIRONO took high-resolution images of the back of the painting. Such an imaging survey of a piece during its restoration is rare. The back of the painting is not visible unless the painting is removed from its mounting, so images of the back provide extremely valuable information. Eten-raku, popular since the Kamakura period, is now known as Gagaku music performed at wedding ceremonies or as a Kuroda-bushi of Japanese folk songs. Though Gagaku was originally instrumental music, the melody of Eten-raku is a favorite among the Japanese. Eten-raku features varied verses. These are known as Eten-raku Ima-yo. Noh plays achieved success with Zeami in the early Muromachi period and sometimes set up a climactic scene by adopting the essence of other performing arts. For example, the play “Ume-gae” has a Gagaku musician’s wife as its heroine and features Eten-raku Ima-yo verses before the heroine dances as she recalls her past. The chanting melody has changed so much that it does not sound like Eten-raku anymore, but restoring the melody of the Momoyama Period should bring out the melody of Eten-raku. Ume-gae was performed publicly by Tessen-kai of the Kanze school in December and featured the melody of Eten-raku Ima-yo, which was restored with the cooperation of Dr. Takakuwa of the Department of Intangible Cultural Heritage. Study of old Noh performances by Dr. Takakuwa has shown that exchanges of the music from different genres, such as Gagaku and Noh, are evident on-stage. 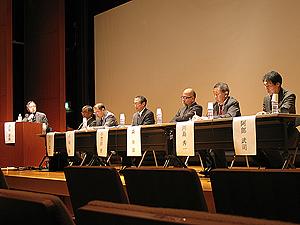 The 6th Conference on the Study of Intangible Folk Cultural Properties was held on December 16th, 2011 with “Intangible Cultural Heritages in Post-earthquake Reconstruction” as its theme. After the huge earthquake in March, various efforts have been made to preserve the culture and cultural properties of disaster-stricken areas. However, the reality is that issues with and information concerning the intangible culture and cultural properties of stricken areas were not adequately shared. Thus, the Department of Intangible Cultural Heritage planned to continue to work on this theme. For the first year, the Department sought to clarify conditions in devastated areas and to share information. Five experts who were working in the Tohoku area before the earthquake or who are providing logistical support to or helping with reconstruction efforts were invited to give lectures at the conference. Two commented from the respective standpoints of academia and administration. Various subjects were raised and discussed from various standpoints thanks to comments from various individuals. Interestingly, the theme of the conference was the earthquake but the actual issues raised preceded the earthquake, such as how to safeguard folk culture, how to deal with a lack of individuals to carry on traditions of techniques and shrinking communities, systematic problems involved in managing intangible cultural heritage, and the force and essential significance of folk performing arts, religions, and beliefs. An extremely unusual event, the earthquake and subsequent tsunami had distorted everyday life and revealed what is essential. One of the invited speakers was from Fukushima, which is struggling with a nuclear power plant accident. Although Iwate, Miyagi, and Fukushima Prefectures are all labeled disaster-stricken areas, conditions in Iwate and Miyagi differ vastly from those in Fukushima. There has been little talk of Fukushima’s reconstruction. As the speaker reiterated, nuclear power is a force that had never been fully controlled by humans and was now present in a form completely divorced from the local culture. Plans are to disseminate and share information by covering issues concerning the stricken areas and restoration. The lectures and discussions at the conference should be published in March. 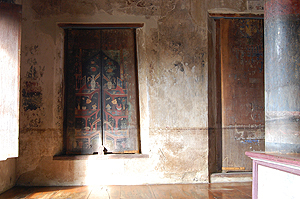 Through a program commissioned by the Agency for Cultural Affairs, flood damage to the ancient city of Ayutthaya was surveyed by 2 successive missions on November 28–December 3, 2011 and December 18–23, 2011. Extremely heavy, continual rainfall starting in September caused massive flooding in Ayutthaya and Bangkok, a fact that was also widely reported in Japan. 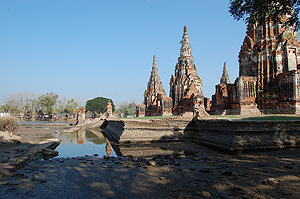 The Ayutthaya ruins, a World Cultural Heritage site, were extensively flooded as well. 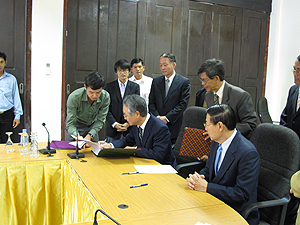 Concerned about the effects of flooding on the site’s conservation, the Thai Government asked for Japan’s assistance via the UNESCO Office in Bangkok. The decision was then promptly made to provide emergency assistance by having experts conduct a field survey. Two experts in measures to counter water damage and conservation of cultural heritage were sent to conduct the first survey, and 6 experts in conservation science, murals, architecture, and photography were sent to conduct the second survey. 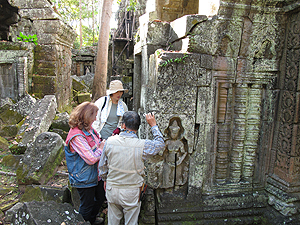 The extent of damage to major sites was determined firsthand together with experts from the Fine Arts Department of the Thai Ministry of Culture and the Japanese Agency for Cultural Affairs. 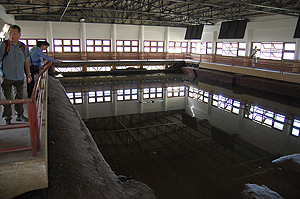 The surveys indicated that flooding was considerable and that some murals were soiled with mud, salt deposits had emerged in places, mud had been deposited on brick foundations, and an exhibition of excavated archaeological remains was submerged. However, generally speaking, direct damage to ruins was limited and most of the damage was relatively minor. Nevertheless, deterioration and deformation of brick stupas and prasats due to aging were observed everywhere. The survey results reaffirmed the importance of continual monitoring and conservation efforts based on a medium- to long-term plan in order to mitigate damage in the event of a disaster. Exploring ways to assist the Fine Arts Department in these efforts is a subject for the future. The National Research Institute for Cultural Properties, Tokyo has long encouraged projects to safeguard cultural heritage in Afghanistan in concert with UNESCO and research facilities both at home and abroad. Efforts to safeguard the Bamiyan site in particular center on the UNESCO/Japanese Funds-in-Trust Project to Preserve the Bamiyan Site and these efforts have been made with the cooperation of the Afghani government and research facilities in various countries. An expert working group meeting on efforts to safeguard the Bamiyan site is held annually so that experts from various countries can share their results and discuss conservation and usage policies. This year’s expert working group meeting was held by the Institute and UNESCO; the meeting was held at the Institute from December 6th to 8th. The meeting was attended by experts from countries of Japan, Afghanistan, Germany, France, and Italy and from the international organizations UNESCO, ICOMOS, and ICCROM. In addition to the ongoing issue of preserving murals and safeguarding fragments of the Buddha statues, attendees broadened their perspective to include the Bamiyan valley as a whole. Attendees discussed surveys of widely dispersed archeological ruins, protection of landscapes, and infrastructure-related issues such as museums and tourism. International Symposium 10 Years after the Destruction of the Buddhas: The Present Situation and Future Vision for the World Heritage Site of Bamiyan. The Japan Center for International Cooperation in Conservation of the National Research Institute for Cultural Properties, Tokyo held an international symposium covering the Asian region in order to consider forms of Japanese cooperation to safeguard cultural heritage and the point of that cooperation. This year marks the 10th year since the destruction of the Buddhas of Bamiyan in Afghanistan, so an international symposium was held to summarize the results of the project to preserve the Bamiyan Site, which Japan was involved in, and to further publicize such efforts. The symposium met twice, once on December 9th in Tokyo and then on December 11th in Kyoto. 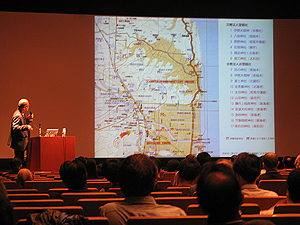 The Tokyo event was sponsored jointly by the Institute and the Nara National Research Institute for Cultural Properties while the Kyoto event was sponsored jointly by the Institute, the Nara National Research Institute, Ryukoku University’s Research Center for Buddhist Cultures in Asia, and Ryukoku Museum. Previous discussion had focused on the issue of reconstructing the destroyed Buddha statues and caves carved out of the Bamiyan cliffs where the statues stood, but the issues of safeguarding ruins throughout the valley and protecting landscapes in response to recent development were raised. The symposium provided a significant opportunity for everyone to consider issues with safeguarding the Bamiyan site and Japan’s future international cooperation. In line with the Agency for Cultural Affairs’ Project to Invite Foreign Artists and Experts in Cultural Properties, the National Research Institute for Cultural Properties, Tokyo invited H.E. Dr. Sayed Makhdoom Raheen, Minister of Information and Culture, from the Islamic Republic of Afghanistan December 4th–8th. Minister Raheen made a courtesy call to Masaharu Nakagawa, Minister of Education, Culture, Sports, Science, and Technology, on December 5th. Minister Raheen expressed gratitude for Japan’s cooperation in preserving cultural heritage and asked for Japan’s continued assistance. On the 6th, he attended an Expert Working Group Meeting on Projects to Preserve the Bamiyan site, he discussed the results of the latest efforts to safeguard cultural heritage in Afghanistan by Japan and other countries, and he also observed efforts by the Tokyo University of the Arts to preserve fragments of Buddhist wall paintings from Bamiyan. In addition, the minister toured a restoration site at the Nikko Toshogu, one of Japan’s foremost pieces of wooden architectural heritage, with the cooperation of the Nikko Cultural Assets Association for the Preservation of Shrines and Temples. Through these activities, Minister Raheen expressed his admiration and gratitude for Japan’s cooperation to conserve cultural heritage in his country. Afghanistan is still in the midst of a civil war, but the invitation of its minister provided an opportunity for close cooperation with Japan on the country’s road to cultural recovery. The Japan Consortium for International Cooperation in Cultural Heritage surveyed the cultural heritage of Bahrain from December 16th to the 23rd. 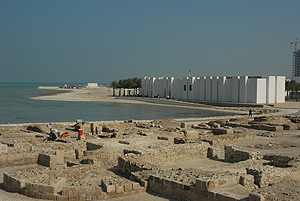 The main goal of the survey was to explore current and future developments in international cooperation to preserve cultural heritage in Bahrain by visiting sites firsthand and determining Bahrain’s specific cooperation requirements. 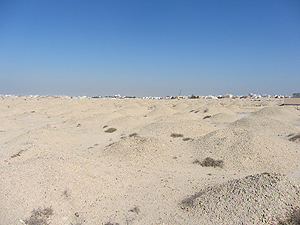 Sites such as archeological sites primarily consisting of burial mounds built around 2200 BC and Qalat Al Bahrain (on the World Heritage List) were visited along with the Bahrain National Museum and historical district in Muharraq. Survey members gathered information and interviewed with concerned personnel. As a result, the survey indicated the need for joint research on maintenance and management after excavations or inscription on the World Heritage List. The survey also indicated the need for long-term technical cooperation in conservation science and training of personnel to safeguard and restore buildings. Plans are to determine the future forms of Japan’s cooperation by consulting with relevant institutions.